JOHN LE CARRRE knows how to create ambiance and whole characters with one sentence, sometimes, one word. His characters always writhe with thought and anguish and his plots are never dull although recently they’ve not had the same empirical intimacy as his spy novels. 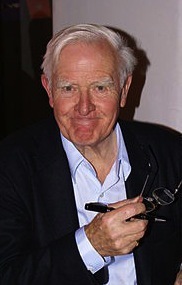 Le Carré is one of the few male writers who can create not only a believable female character but one who lives thrillingly on the page and with whom a female reader can identify; like Tess, in THE CONSTANT GARDNER. Rachel Weisz won as Oscar for playing her exactly as vividly written. Le Carré can do back-story like nobody else, you hardly notice you’ve slipped into it and you're even sorry to get back to the main story. None of the movies made from his books have come close to doing the books justice which, I think, tells you how good his writing is. Or maybe, how crap the directors are at capturing his worlds. It’s not the actors’ fault, they’re always wonderful but I think you have to be English to successfully direct a le Carré novel. The wonderful BBC television series of TINKER, TAILOR, SAILOR, SPY almost captured Smiley’s tortured but razor-sharp persona and the general murk of the times. A now we can look forward to the film of A MOST WANTED MAN, with Robin Wright, possibly Willem Dafoe and directed by Anton Corbijn. My favorites: THE HONORABLE SCHOOLBOY, A PERFECT SPY, THE NIGHT MANAGER (Soon to be a major motion picture from Brad Pitt’s production company and Paramount Pictures).